Those faults on the power system which give rise to unsymmetrical fault currents (i.e. unequal fault currents in the lines with unequal phase displacement) are known as Unsymmetrical Faults on Three Power System. On the occurrence of an Unsymmetrical Faults on Three Power System, the currents in the three lines become unequal and so is the phase displacement among them. It may be noted that the term `unsymmetry’ applies only to the fault itself and the resulting line currents. However, the system impedances and the source volt­ages are always symmetrical through its main elements viz. generators, transmission lines, synchoronous reactors etc. There are three ways in which unsymmetrical faults may occur in a power system (see Fig. 18.1). It is a simple method and gives more generality to be given to fault performance studies. It provides a useful tool for the protection engineers, particularly in connection with tracing out of fault currents. In 1918, Dr. C.L. Fortescue, an American scientist, showed that any unbalanced system of 3-phase currents (or voltages) may be regarded as being composed of three separate sets of balanced vectors viz. balanced system of 3-phase currents having positive (or normal) phase sequence. These are called positive phase sequence components. a balanced system of 3-phase currents having the opposite or negative phase sequence. These are called negative phase sequence components. a system of three currents equal in magnitude and having zero phase displacement. These are called zero phase sequence components. The positive, negative and zero phase sequence components are called the symmetrical compo­nents of the original unbalanced system. The term ‘symmetrical’ is appropriate because the unbal­anced 3-phase system has been resolved into three sets of balanced (or symmetrical) components. The subscripts 1, 2 and 0 are generally used to indicate positive, negative and zero phase sequence components respectively. For instance, IR0 indicates the zero phase sequence component of the current in the red phase. Similarly, IY1 implies the positive phase sequence component of current in the yellow phase. a balanced system of 3-phase currents, IR1,IY1,IB1 having positive phase sequence (i.e. RYB) as shown in Fig. 18.3 (i). These are the positive phase sequence components. 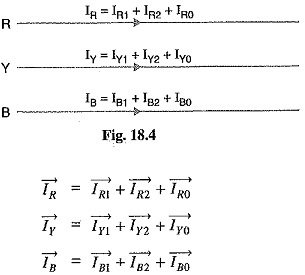 a balanced system of 3-phase currents IR2,IY2,IB2 having negative phase sequence (I e. RBY) as shown in: 18.3 (ii). These are the negative phase sequence components. a system of three currents IR0,IY0,IB0 equal in magnitude with zero phase displacement from each other as shown in Fig. 18.3 (iii). These are the zero phase sequence components. The current in any phase is equal to the vector sum of positive, negative and zero phase sequence currents in that phase as shown in Fig. 18.4. The positive phase sequence currents (IR1,IY1,IB1), negative phase sequence currents (IR2,IY2,IB2) and zero phase sequence currents (IR0,IY0,IB0) separately form balanced system of currents. Hence, they are called symmetrical components of the unbalanced system. The symmetrical component theory applies equally to 3-phase currents and voltages both phase and line values. The symmetrical components do not have separate existence. They are only mathematical components of unbalanced currents (or voltages) which actually flow in the system. In a balanced 3-phase system, negative and zero phase sequence currents are zero. The operator ‘a’ is one, which when multiplied to a vector rotates the vector through 120° in the anticlockwise direction. 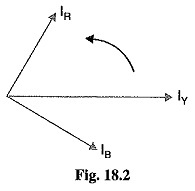 Consider a vector I represented by OA as shown in Fig. 18.5. If this vector is multiplied by operator ‘a’, the vector is rotated through 120° in the anticlockwise direction and assumes the posi­tion OB. If the vector assuming position OB is multiplied by operator ‘a’, the vector is further rotated through 120° in the anticlockwise direction and assumes the position OC. Thus the operator ‘a2, will turn the vector through 240° in the anticlockwise direction. This is the same as turning the vector through 120° in clockwise direction.